Poster for the Postgraduate Poster Competition put into a Prezi presentation. After some tweaking we now have a zooming interface to explore the poetry check it out. Currently we do not have support for Microsoft Internet Explorer. If you have landed here it may be because you can’t view the zooming interface in your browser. You could try using Chrome or Firefox instead. 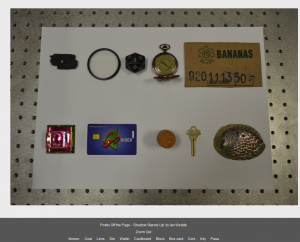 Otherwise below is a zooming presentation of the objects and the micro-machined poems if you want to view them in Internet Explorer. If you load up the presentation and view it I recommended using the full screen mode. those shadows, waiting for us? To prepare a surface to machine on we got a paua shell from someones bach. We then ground it down using 3 different grit sand papers and finally buffed and polished it using diamond paste with the help of the rock polishers in the geology department.The surface presented some problems as the paua is actually a grating a ridge structure from the layers of calcite paua uses in their shells. Initially we tried to use the nanosecond laser system using a really tightly focusing lens we found that we really damaged the shell. We ended up using the femtosecond direct write to machine the shell and found how comparably clean the machining was compared with using nanosecond pulses (about a million times longer in duration). 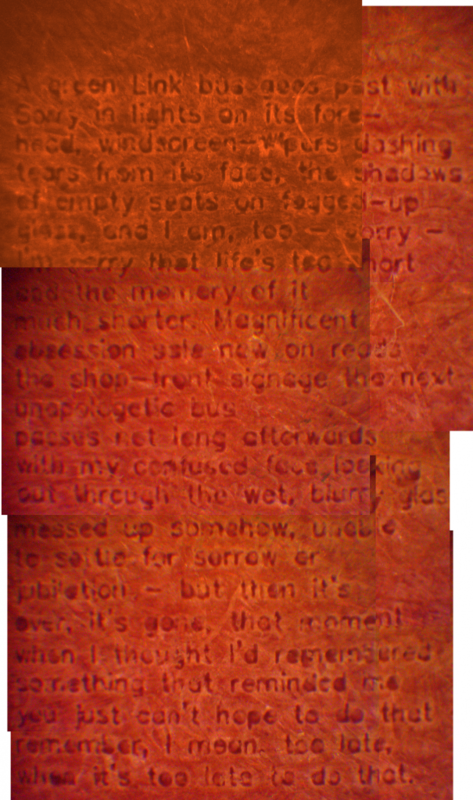 The poem ended up being 1.2 mm across. 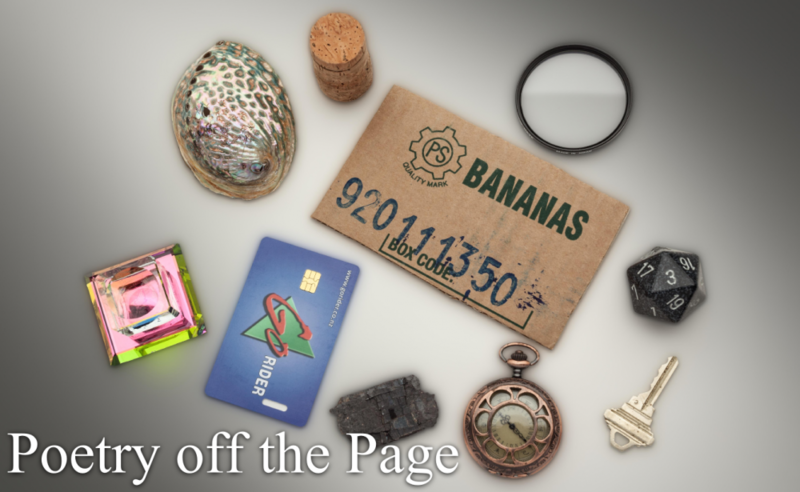 The imaging of the paua shell was also challenging as the curvature made it hard to focus on the text. 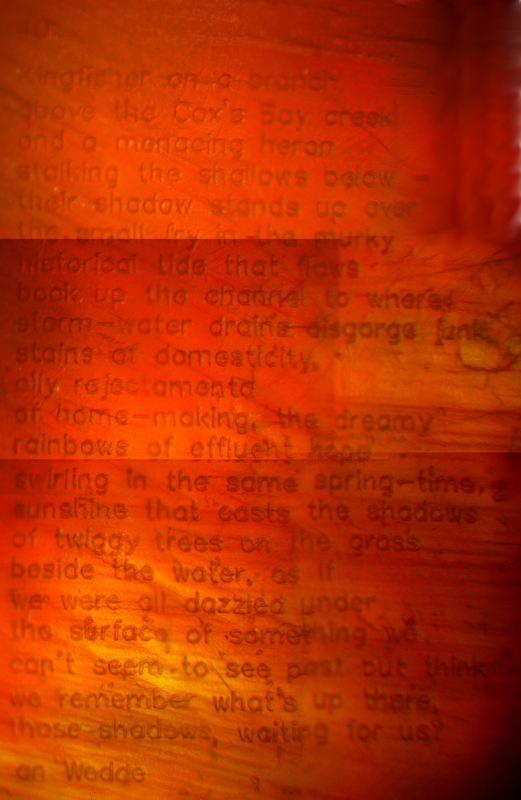 Nine images needed to be taken and merged together to get an in-focus image of the whole poem. This was perhaps the most challenging object but also one of the most satisfying to complete. by the time their lunch was served. We wanted to go really small with the metal as the femtosecond laser can machine metal very easily. 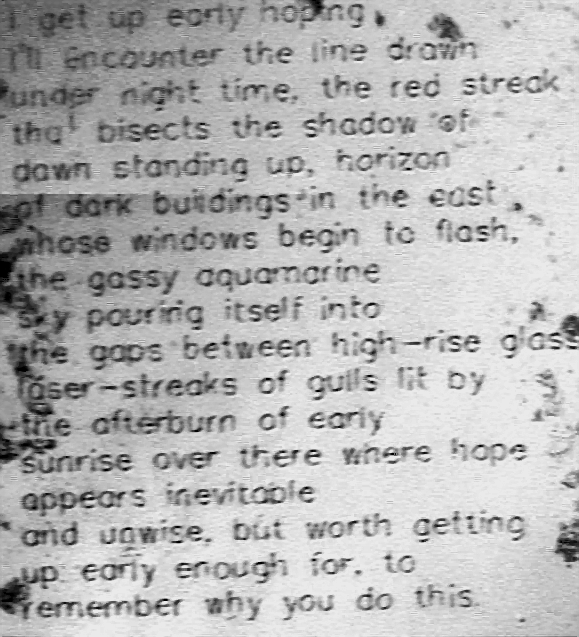 We masked the beam and magnified it down to a microscopic spot and managed to get the whole poem down to 0.6 mm across. That makes each letter around ~10 microns across about a tenth of the width of your hair. We had to use an electron microscope to be able to view the poem. Femtosecond laser machining was used to inscribe the poem onto the cork. The cork has small fibers which made it difficult to see the poem if it was too small but also large craters which meant we couldn’t machine it too large we settled with 3.5 mm across. The image is made up of over over 10 images under the microscope that are all stitched together. light on the footpath outside. The bus card made of plastic was machined using the UV nanosecond laser. 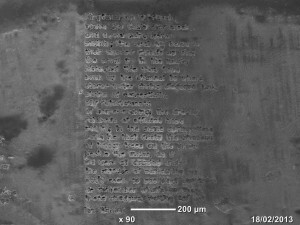 The width of the poem is 0.8 mm across. remember why you do this. Machining glass is always challenging for laser machining however the femtosecond laser makes it easy to machine these difficult materials. 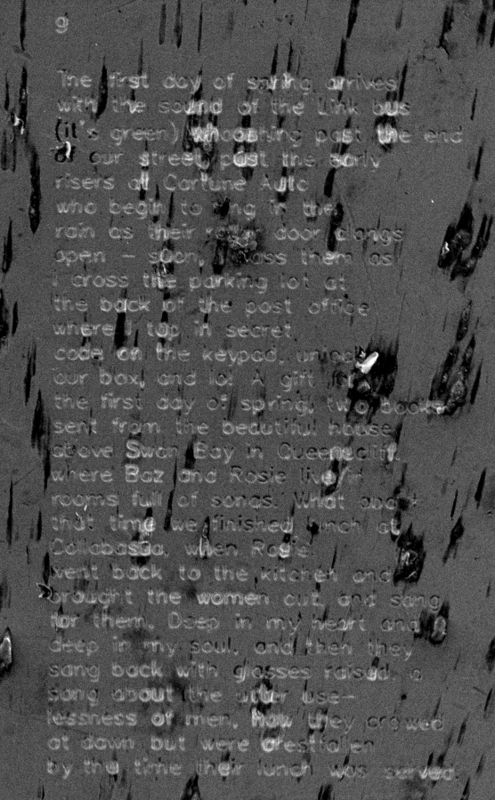 The problem with imaging the poem was that the pedestal is in the way of the microscope objective so we ended up having to use long focal length camera with a telescopic zoom on it. 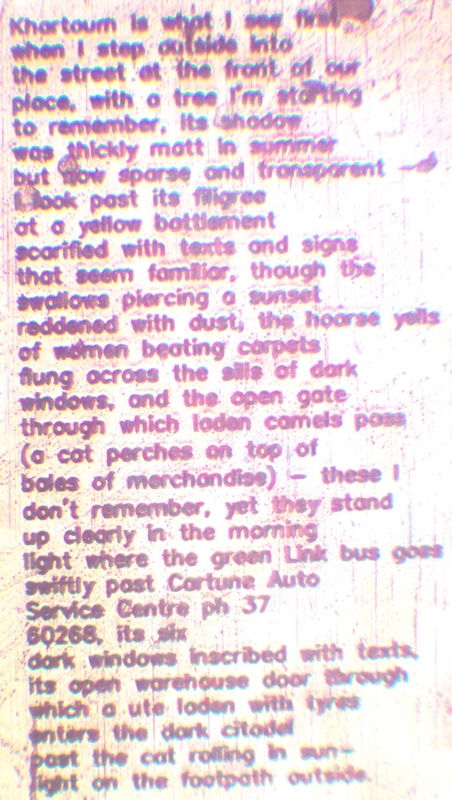 The whole poem is only 0.8 mm making it one of the smallest poems. when it’s too late to do that. The femtosecond laser was used to machine the cardboard. Due to the large size of the fibers we had to make this poem slightly larger than the others at 3 mm across. We initially machined the cardboard and found that someone had used it as a cutting board for some samples in the lab. So we went into town to the countdown and asked for some banana boxes for writing microscopic poetry on. We got some quite puzzled looks.